Basically, the Rust Belt before it rusted. Remember the days when progress was measured not in bandwidth, but in horsepower? Of course not; you're not 100 years old. And so you never pored over this map as an impressionable teenager. 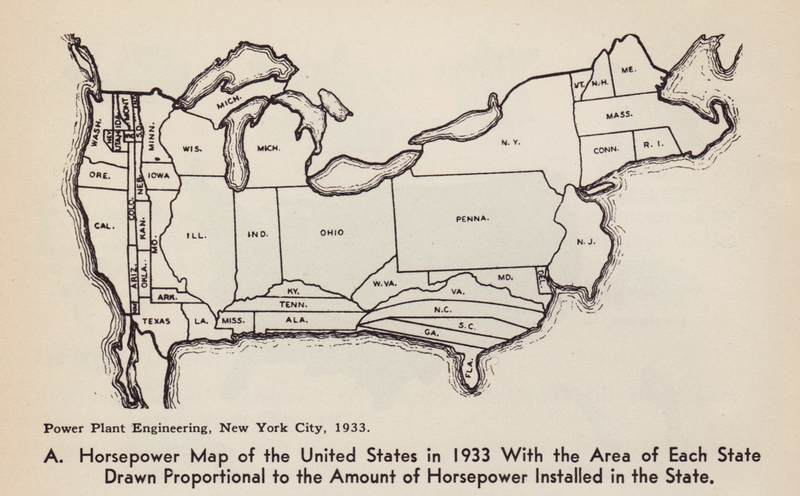 This Horsepower Map of the United States distorts the area of each state to reflect the amount of horsepower installed. Not actual horses, mind you — the year is 1933, not 1833 — but horsepower as a unit of measure for mechanical power (i.e., 1 hp = 746 watt) and ultimately industrial output. What this cartogram shows, therefore, is where the industrial muscle of the U.S. was located back in the early 1930s. Basically, the Rust Belt before it rusted. The attention is immediately drawn to Pennsylvania, so big and square that it looks like the very cornerstone of America's industrial might. Ohio and New York are the two other main powerhouses; and to a lesser extent Massachusetts (and the rest of the New England states) and Illinois (plus other states in the Midwest). The South and West are remarkably insignificant: Florida seems about the size of Vermont and Kentucky fits in Rhode Island twice; while California is smaller than New Jersey and Texas is outsized by Connecticut. Some states are so tiny, horsepower-wise, that they're barely visible on the map. The combined industrial wattage of Nevada, Utah, Idaho, Wyoming, Montana, and North and South Dakota is still smaller than that of Maine. As they say: The past is a different country. But so is the future. How will tomorrow's economic performance be measured? And where will America's muscles bulge? Map found here on the excellent Making Maps blog.